While some Breakfast TV shows attract plenty of media coverage, sometimes for nudie runs, wigging-up TV parodies or petty ratings wars, ABC News Breakfast has chalked up its 8th year as a quiet achiever. 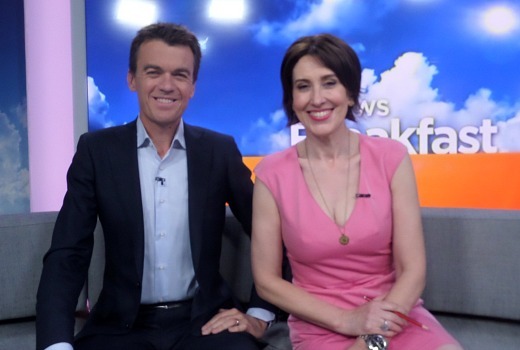 Hosts Michael Rowland and Virginia Trioli may not be in the headlines for their personal lives, but they know the pressure of Live TV, breaking news and ridiculous starting times. “I’ve got tremendous respect for anybody who works in Breakfast television. Karl or Lisa, Kochie or Sam,” Rowland admits. “We have the market we’re chasing, they have their market. So that’s fine. But everybody is doing a fantastic job,” agrees Trioli. “We’ll leave them to fight the ratings war because ratings matter more to them in the sense that they have to sell ads. We don’t. I’ve always believed we have a fiduciary obligation, if you like, simply because we receive taxpayers’ money to reach as many people as possible and justify the money we’re given, and we work damn hard to do that. As the only national morning show produced daily from Melbourne, News Breakfast has also had to find its point of difference -without being perceived as being too serious. Trioli nods to “great conversations” as a defining part of the brand. “They are often solid news-based conversations and interviews but they are also discursive and magazine-style. So they have been an absolute excellent highlight and a great switch-on factor into our Reach,” she explains. “We broadcast on terrestrial TV of course. “But we can push it out via Facebook and Twitter and we use Instagram. We’re pushing out our content on so many different platforms. “It builds this fabulous word of mouth run, around conversations with people like Dolly Parton, Harvey Fierstein, Cyndi Lauper… .whether it be artists or musicians… great people who have come our way we’ve been able to talk to at length and in depth. Preparation is key, Rowland continues, not just reading the book and seeing the film for guests in advance, but having extended knowledge. “You know a fair about Dolly Parton, Cyndi Lauper, Quentin Tarantino…. “‘Do your homework, do your research,'” Trioli adds. “All of that is separately and individually done by us, when we have people coming in. News Breakfast pulls around 150,000 metro viewers a day on ABC and News 24, around half its commercial competitors. But its Reach with national and international viewers is much wider. The show has also uncovered experts and regular guests including, Joe Siracusa, Greg Barker, Andrew May, Wendy Tuohy, some of whom have made the leap to other networks. “The ABC has traditionally been a nursery for journalists going off to work in commercial TV. But our show has been a nursery for guests. You often see someone on the commercial breakfast shows who has been a regular on our show for months,” says Rowland. “We made those people! Michael might be phlegmatic about it, but I’m not!” insists Trioli. The latest to be poached is the show’s very own weather presenter Vanessa O’Hanlon, about to host Nine’s new regional bulletins in New South Wales. “Bless her Breakfast soul,” says Rowland. “Yes she leaves an enormous, gaping hole in Breakfast. (She is) one of the founding members and it’s going to be quite a process to replace her. She’s been such a valuable member of the team. It was really like losing a family member. I think we all felt that. “There were tears. I was very upset and the viewers went absolutely crazy. “Michael and I are not prepared to leave now because the reaction clearly won’t be as strong. So we’re now condemned to stay!” quips Trioli. At the time of publication her replacement is yet to be announced. News Breakfast is also doing its bit for diversity at the ABC, including finance expert Del Irani, plus Jeremy Fernandez, Mohammed El-leissy, Sami Shah, Susan Carland. It’s a word high on the priority list at the broadcaster, under managing director Michelle Guthrie. “But it always offends me that women have been caught up in the Diversity (discussion). I didn’t know that being a woman was ‘diverse’ when we are actually more than 50% of the population,” Trioli suggests. “This (will) give you an indication of how far we have come in this country -at school I was called a ‘wog.’ Now I’m not diverse-enough. So something’s changed. Asked to nominate some of their personal viewing favourites, Rowland highlights Bloodline, Gogglebox, commercial news, iview, Netflix, while his kids love watching RBT. Trioli happily mixes her news viewing with Reality TV. “ABC Kids, commercial news, Four Corners, Bloodline, The Crown, The Fall. I really got into The Bachelor, The Bachelorette, and (Australian) Survivor was a great bit of TV -it’s taken me years to get there,” she admits. “But I just loved it as an exercise in psychology. “I find a real need to engage a different part of my brain. But I also want to be part of the national conversation. Trioli and Rowland are back on air today, after sports Presenter Paul Kennedy co-anchored the Summer edition. After a big news year in 2016 -including elections, Olympics and Brexit- they are steeling themselves for another 12 months. “I think we’ve said the same thing for the last three or four years, ‘That’s the biggest news year we’ve had.’ Then the next year comes along and it’s even bigger,” says Trioli. “How could you possibly have a bigger news year? And we have and we did. And it’s a testament to the fact that it’s almost nine years that we’ve been doing this. We know how to do this. We’ve built up a fantastic production team, a great understanding on the technical side, the editorial was always there, the presentation is –if can say- terrific and it just comes together. ABC News Breakfast screens 6-9am on ABC and News 24. No cash cows and blocks of cash trying to buy viewers. Very good reading. Thankyou ! My problem is that, though I whinge and carry on about Sunrise and Today, I am a creature of habit and just find it so hard to remember to switch over and try something else. So did I & I went to Donvale High with you, back in the day. I am so proud & chuffed, to know that you became successful. P.S. Back then, I never thought of you as a Wog!!! I switched from Sunrise which I had watched since I was a kid to ABC breakfast a couple years back and wished I had switched sooner! I love the work they do and watch everyday, it’s nice to have presenters that actually have an interest and passion into the news and not just reading the prompter. With Radio Australia and the NT Shortwave radio going off the air at the end of January, it will be the only source of Australian news for those holidaying in areas where the internet is slow or doesn’t reach. Every hotel has Australia+ available. And of course there’s an hour of program, not 40mins plus 20mins of commercials. They watched by more people than Today and Sunrise combined when their Australia+ audience is included. Sunrise now carried by EMTV in PNG, having recently dumped Today after many years. What are the Australia + numbers? I’ve never seen International figures so please pass on. If only .1% of China watched……. but Australia+ doesn’t air in China. Love ABC News Breakfast, So professional but also light and funny at times. Rather than just touching on a major story you get great background. And their guests, like Sara James just add to the show. Also they interact with social media, the commercial networks totally ignore it..just posting their stories but no interaction with viewers. And don’t forget Paul Kennedy, he can do sport or stand in and cover news topics in depth. Imagine Mark Beretta being able to do that. given the competition of people laughing like hyenas & generally carrying on like idiots on the other breakfast shows, its made their jb rather easy i’d say!